Samsung has always been a trailblazer when it comes to creating powerful and practical phones that cater to what people want, not what some bunch of suits think you ought to have. Last year’s Galaxy S9 series and Note9 introduced better cameras and faster performance with their signature design without ditching anything its predecessors offered. Now, their Galaxy S10 series phones which will make their global debut in a matter of days look set to set the bar even higher as this leaked image from noted tipster Evan Blass demonstrates. While renders have come up across the grapevine, this is apparently a promotional image of the S10 for use in signage and other advertising material and it shows a number of very pleasing features to be jubilant about. 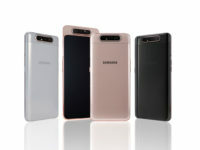 The promotional image shows a good view of the base of the Galaxy S10+ done up in silver trim and it sports a USB Type C port, a speaker grille and – rejoice – a 3.5mm audio jack. The rest of the image shows a slick Infinity display with a punch-hole for the selfie cam in the upper right corner that speculatively may be dubbed as an Infinity-O display on wordpress account of an earlier example that debuted in a China-exclusive Galaxy A8S phone last year. As expected, they have to yet furnish this new panel for the S10 series with an official designation. The punch hole is more of an oblong shaped hole, presumably because the Galaxy S series phones usually integrate an iris+face scanner and it is highly likely the S10 series will continue in that vein. 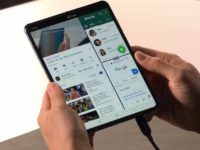 This will likely give the phone an even larger screen-to-body ratio than its predecessors who managed a decent 19.5:9 ratio. 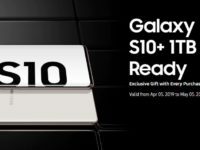 By inference from the signage, Samsung will likely continue the same playbook and debut a larger sized Galaxy S10+ and a smaller Galaxy S10 though there is also speculation this time around on the existence of a smaller pared down model than the S10. As always, everything ought to be taken with a grain of salt ahead of the official launch but if this image is taken as fact, and so far this tipster has been renowned for his reliability, then we can be assured that there’ll be at least two S10 variants, that it retains a 3.5mm audio jack and it will have a punch-hole display up front. We’ll continue plumbing the rumour mill and we’ll fill you in as details surface ahead of the Samsung Unpacked launch this coming February 21 2019.